In between getting married and moving to our office in America, Charlie Swanson took an incredible fact finding safari through some of East Africa’s finest safari destinations. We asked him to pick out some of his highlights. To see the mountain gorillas you have to ‘track’ them first. You set off in the early morning with your guide and a small group of fellow wannabe primatologists in search of your assigned gorilla family. The actual tracking can take anything from 20 minutes to seven hours (the guides will try to ensure you get a group suited to your fitness level) depending on where the group has decided to eat that day. Scrambling up steep hills, cutting through bamboo and negotiating your way through the dense undergrowth all adds to the adventure. The fact that the gorillas aren’t presented to you on a silver platter, that you have to find them if you want to see them, was one of the best bits of the whole experience for me. As you approach you can hear the gorillas grunting and moving around in the foliage. Then you can smell them – a strong almost human-like musk. You are led into the viewing by a tracker who has been following your gorilla family since first light. You have just an hour to watch these incredible animals. The juveniles play with one another like human children, there’s eating, grooming and even fighting. What amazed me was just how close you get. 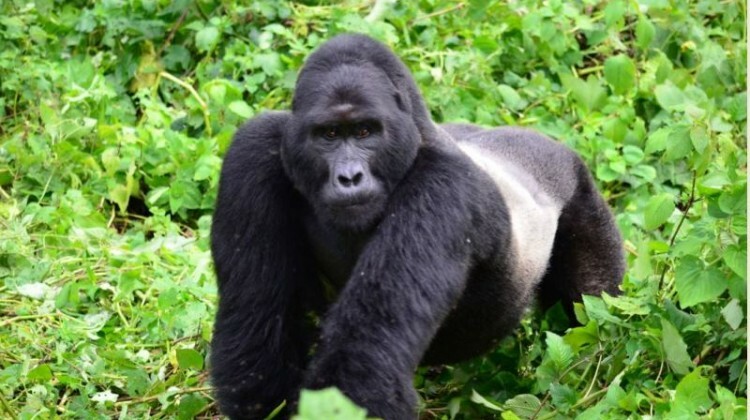 You’re supposed stay seven metres away as gorillas can catch many of our illnesses. But they don’t know this and in one sighting we had inquisitive youngsters wanting a closer look and colossal silverbacks charging within metres to assert their undisputed dominance. It’s hard to sum up in words what was one of the most magical wildlife experiences I have ever had – it felt real and adventurous and was over all too quickly. I was stunned by the incredible diversity of this country and just how much it has to offer. From lions and elephants in the Queen Elizabeth National Park, to chimpanzees in Kyambura Gorge, volcanoes and pygmies in the Mgahinga National Park and of course gorillas in the Bwindi Impenetrable Forest. Uganda has the lot. The scenery here is stunning and there was a genuine warmth from all of the people I had the pleasure of meeting. City hotels don’t have to be boring! Sharing breakfast with a Rothschild giraffe at Giraffe Manor and sipping sundowners with a white rhino in the Nairobi National Park while staying at The Emakoko, were perhaps two of my most unexpected highlights. The sheer number of animals and quality of sightings in the Masai Mara never ceases to amaze. There is a real magic to this place and to see it through the eyes of a local Masai guide, born and raised nearby, is an experience like no other. It is justly famous for excellent wildlife viewing, and the great migrating herds which graze the short grass plains from July to October every year. There are areas that get crowded in the high season but by using small camps like Kicheche Bush Camp and Mara Plains or private houses like Acacia House you can still escape the crowds. Combine that with expert Masai guides and it is still very much a must visit destination. A cultural highlight was visiting the singing wells at Sarara. Samburu warriors dig wells in the dry river bed here to bring up precious clean drinking water for their cattle. The warriors sing in a haunting rhythmic tone as they work, each singing a slightly different song recognizable to their own herd which draws their particular animals to drink. It is one of those scenes that would have looked exactly the same for hundreds of years. Photography is not allowed so you have to visit to see it! Sarara is also one of the most beautiful places in Africa and a particular hot-spot for leopard sightings. Getting off the beaten track in Laikipia (northern Kenya) and experiencing the real wild Kenya first hand was a real treat. Whether you are on a mobile camel-supported walking safari with Karisia, tubing down a river at Ol Malo, or riding at Borana, this is the place to come for adventure.